The rupee on Tuesday strengthened by 45 paise to close at a one-month high of 55.07 against the US currency tracking a jump in local shares triggered by Finance Minister P Chidambaram's promise of bringing the economy back on track. Persistent dollar selling by exporters and some banks, increased capital inflows and weak dollar overseas also kept the rupee rally upbeat as it marched upward for the third straight day, said forex traders. At the Interbank Foreign Exchange market, the rupee resumed higher at 55.32 a dollar from its overnight close of 55.52. 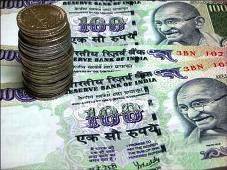 The rupee later moved in a range 55.51 and 55.06 before ending at 55.07, showing a rise of 45 paise or 0.81 per cent. This is the highest closing for the rupee since it had settled at 54.97 on July 5. The new Finance Minister on Monday unveiled a roadmap to prop up the country's economic growth, helping the stock market benchmark Sensex to gain nearly 189 points while foreign institutional investors pumped in over Rs 800 crore (Rs 8 billion) into local stocks. "The rupee took cue from the Euro and other Asian currencies, which were trading higher against dollar. "The statement from Finance Minister regarding solution of tax issues and investor friendly regime supported rupee," Hemal Doshi, Currency Strategist, Geojit Comtrade. Dealers said robust capital inflows helped the rupee hold to gains. billion in this calendar year. Pramit Brahmbhatt, CEO, Alpari Financial Services (India) said: "The assurance of the FM to fine tune the reformative process to attract larger dollar inflows. . .aided rupee". Experts said with the dollar index was down by 0.16 per cent against six major rivals, the sentiment helped rupee. Going ahead, if rupee breaches 54.70-80 level, then it may appreciates to 54.20 level in the next few trading sessions, they added. The dollar index headed towards the previous lows on active risk on in global markets thereby strengthening the emerging market currencies, said Brahmbhatt. CRISIL Research on Tuesday said rupee is now expected to settle around 53 per dollar by March-2013 compared to their earlier forecast of 50 level. The premium for the forward dollar dropped further on sustained receivings by exporters. The benchmark six-month forward dollar premium payable in January declined to 173-175 paise from Monday's close of 180-182 paise. The premium for far-forward contracts maturing in July also dipped to 316-318 paise from 327-329 paise. The RBI fixed the reference rate for the US dollar at 55.4995 and for euro at 68.6990. The rupee continued to rule firm against the pound sterling to 86.18 from yesterday's close of 86.38 and also ended further strong against the Japanese yen to 70.24 per 100 yen from 70.87. However, it recovered against the euro to 68.40 from its last close of 68.60.